WPC Decking has been derived in India as WPC wall cladding, flooring, planks. It is made with Reliance polymers like PE/PP and PVC. 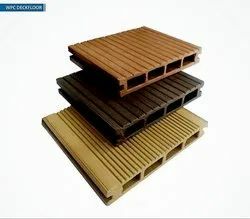 Generally known as WPC Decking it is widely accepted and being used for outdoor living applications. It is used on walkways, Platforms, terraces, traffic squares, courtyards, garden coverings, swimming pool surroundings, river sites, pond sides, water areas, dam areas, corridors etc. This is an all weather product. WPC Deck Floors are the best alternate for the traditional use of wood and plywood for its durability and thermoplastic for its flexibility. 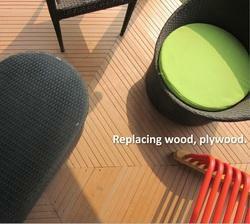 WPC Deck Floors are the overcome of the entire problem faced with the plywood. WPC Wall Cladding is a well known WPC product, widely used for Exterior wall coverings, globally. It has equal use in interior surfaces also. Major application remains with outdoor wall paneling such as villa exteriors, apartment exteriors, hotel exteriors, hospital exteriors, commercial building exteriors, architectural layouts, educational institutions etc. This is an all weather product. WPC Wall Cladding is a durable, biodegradable and environment friendly product. They can be installed, trimmed and painted with commonly available products and tools. Scraps are biodegradable and can be recycled with other paper products. WPC Wall Cladding gives typical natural touch to overall ambience where it is used. Technically, it reduces sunshine reflection and absorbs UV radiation. Socially, it is a green product that protects environment with its natural characteristics of anti-water, anti-fungus & anti-termite. Our industry experience has allowed us to come up with an outstanding range of WPC Planks. This range of products is fabricated by utilizing finest quality raw material and advance tools. Obtainable to the customers in various polishes, these WPC Planks are broadly desired for its fine finish, termite free nature and high quality. WPC Pergolas and Gazebo are popularly known across the nation for its unique identity with luxurious landscaping. It involves Pillars and Rafters (as beams) as major components. Pergolas with beautiful installations added with seating, green hanging planters and flowers creates real views of nature. For villas, gardens, colony plots, restaurants, tea posts, road side refreshment areas Pergolas are becoming favorite because of its woody look. Made with wood and polymer with different surfaces like 'sanded' or 'brushed' or 'embossed' pergolas are a perfect replacement of conventional wooden structures. It is available in customized wood alike colors. 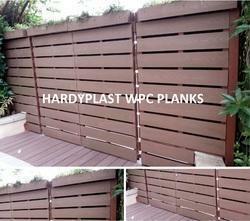 WPC Composite Decking from HARDYPLAST has eminent quality for outdoor applications. Natural wooden colours in custom lengths and surface finishes will make architect projects and landscapes, just beautiful. Packaging Details: Pack of 4 pcs per 3 ply corrugated box. With an aim to serve our clients in the best possible manner, we are engrossed in offering a wide assortment of WPC Deck Tiles. Manufacturing and designing of offered titles are done by a team of dexterous professionals with the aid of finest quality basic materials and pioneering machines. Provided tiles are used for paving walls in order to protect from damages at both commercial as well as residential places. 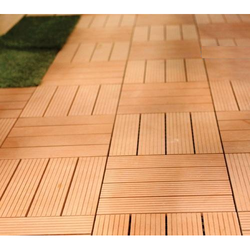 Furthermore, the offered WPC Deck Tiles can be purchased from us at cost effective prices. HARDYPLAST WPC RAILINGS, a precise replacement of conventional natural wooden railings. It is a life time product for fixing to your railing needs for balconies and internal ladders and many other applications. It can be applied with beautiful wooden finishes with varnish and pu finshes. Packaging Details: Packed in corrugated box.